Nine years later, Eskarina is a happy and normal nine-year-old child, happily terrorising her older brothers and learning the ways of the world. Local witch Granny Weatherwax is less happy about the magical staff left to her by the wizard. When Esk's burgeoning magical powers threaten to cause chaos, Granny realises she has to get Esk enrolled at Unseen University, which given that the university specifically prohibits women from joining (on the grounds they'd probably be too good at magic) could be rather problematic. Equal Rites sees Terry Pratchett setting out his vision of what the Discworld series is going to be. No previous characters from the first two books turn up (with one orange-furred and banana-stained exception), and there isn't even any mention of those events. Instead we have new characters having new adventures. Pratchett also starts to use his creation to address real-world concerns here, in this case feminism. He doesn't go too overboard and the humour remains fairly broad, but you can almost sense the author thinking that maybe the funny planet with the turtle and elephants can be used for something more interesting than just poking fun at Lovecraft and Conan, amusing as that may be. Unfortunately, this idea falters a bit since Esk's story is meant to make Unseen University a co-ed establishment, bringing in female wizards and making it more equal. As later books show, none of this happens, Esk is never mentioned again and UU remains a male-only establishment in the latest novels, twenty-odd years after Esk's time. Given how well Pratchett develops his world, this lack of evolution is disappointing and seems to contradict the book's pro-feminist theme. It's also the first appearance of Granny Weatherwax, one of his most iconic characters. She's a mere embryonic shadow of her later self here, but already some of the character's more intriguing traits are developing. We also continue to get through the revolving door of Unseen University Archchancellors with Cutangle becoming an interesting character as the story develops. As usual with these earlier books there are some weaknesses, most notably that Pratchett is re-using the idea that the fate of the whole Disc is at stake as creatures from the Dungeon Dimensions attempt to break through the fabric of reality, which he uses rather a lot in these first dozen or so books. 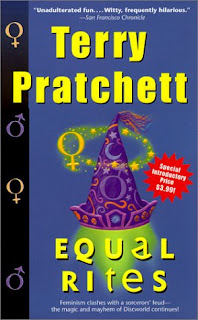 Equal Rites (***) is another funny and fast-paced read, but you can start to see Pratchett developing some more sophisticated ideas of what he can use the Discworld series for. The book suffers from being somewhat slight and insignificant (aside from Granny Weatherwax's first appearance, the events of the book have next to no impact on the wider world and series) but is still moderately entertaining. However, from the next book Pratchett is starting to roll out much bigger and more intriguing guns. The novel is available now in the UK and USA. I'm beginning the series from the start myself having read the latest novels first and Equal Rites is next on my list. Heard alot about Granny Weatherwax so should be good. As for the humour, I was surprised both the Colour of Magic and Light Fantastic still had genuine laugh out loud moments (perhaps not as much as later books). The Prince of Nothing to become a TV mini-series?